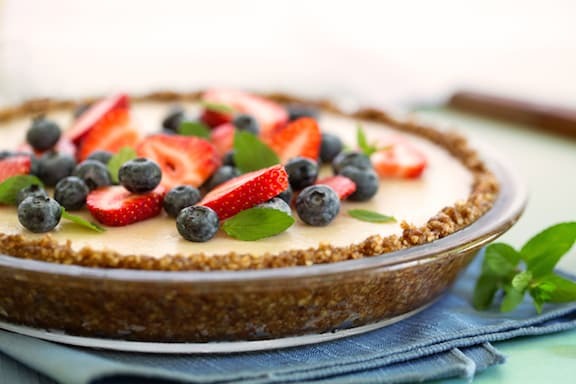 This simple vanilla filling for a no-bake pie filling sets up beautifully and becomes a luscious canvas for fresh fruit. Try it with berries in the summer; apples, pears, or tiny oranges in the fall or spring. Look for agar powder, a seaweed-based gelling agent, at any natural foods store. Recipe and photo by Hannah Kaminsky. This simple vanilla filling for a no-bake pie filling sets up beautifully and becomes a luscious canvas for fresh fruit. Set a medium saucepan over the stove and pour in the non-dairy milk. Mix together the sugar, cornstarch, agar, and salt in a separate bowl before adding the mixture to the pot, whisking vigorously to break up any lumps. Cook over medium heat, whisking frequently and taking care to scrape the bottom and sides of the pot, preventing anything from sticking and burning. Bring the mixture up to a boil, at which point the pudding should seem considerably thicker. Add the vanilla extract and continue cooking for 2 more minutes. Turn off the heat, letting it stand for 5 minutes before transferring to your prepared pie crust. Allow the filling to come to room temperature before moving into the fridge. Thoroughly chill for at least 2 hours until it has fully set to a sliceable consistency. I just made this- the pudding became a large gelatinous glob. Is it supposed to be 5 tablespoons vs. 5 teaspoons of corn starch? Did you use agar flakes or agar powder? Thanks. Michael, I’ll have the author of this recipe respond to you ASAP and we’ll find out what the discrepancy might be. Sorry! Hi Michael- So sorry for the trouble. 5 tablespoons of cornstarch is correct, and it should be agar powder, not flakes. The final consistency should be a much firmer gel than a traditional custard, since it needs to set as a sliceable pie filling. If you want a stand-alone, creamy pudding, I would recommend omitting the agar entirely. Thank you for your prompt response. I suspect my expectations were for the creamy pudding consistency- thanks for the suggestion. I just tasted a slice and it is quite tasty. I used homemade cashew milk. It is easy to slice. I would say the texture is more like a very firm pudding, rather than Jello- a positive for me.